This page explains the various status which can be found in the operation dashboard. The pictures below are not the "real time" ones, they are jsute examples of the different values of each field. >>Click here for the present status of the beam. Blue : for 2 beamlines only, ANATOMIX and NANOSCOPIUM, which share their front end and first hutch. When the beamline is blue, it does not take the beam whereas its neighbor does (this one is therefore green). The graph shows the intensity of the electron beam in the storage ring as a function of time (in hours). 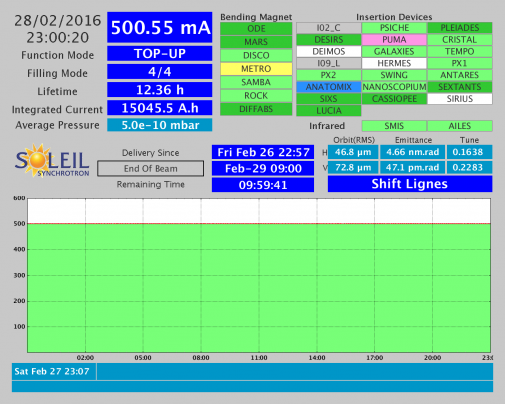 The value in mA (miliamperes) is shown in real time in a blue box, on top left of the dashboard. 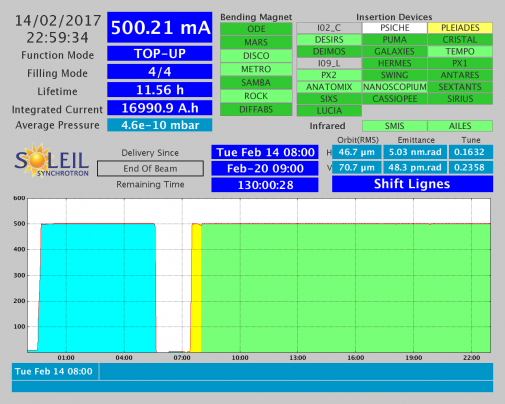 Yellow: the beam is not delivered to the beamlines, it is used for Machine studies, such as optimisations, settings or research. It is a Machine Run. Blue: the beam is used for radioprotection controls on one or several beamlines. 8-bunch mode: 8 bunches of electrons, regularly spaced, are circulating in the storage ring. Hybrid mode: 301 bunches of electrons are circulating in the storage ring, among which 300 fill 3/4 of the ring and 1 is isolated in the middle of the remaining 1/4. 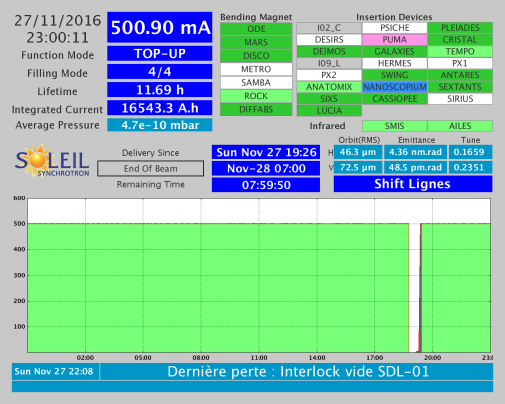 This field indicates the date and time of the next "end of avalaibility of the beam for the beamlines". It also shows the remaining time before this moment as a countdown. 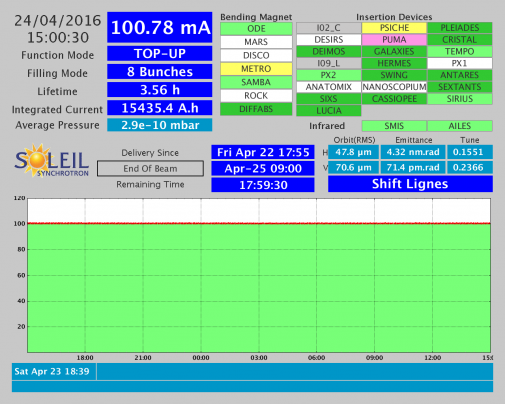 This field indicates when the beam was made available for the beamlines. This field indicates, during Machine Runs, when the beam is made available for the beamlines. Lifetime of the beam if there is no injection of "new" electrons. This lifetime, in hours, is the time needed for the intensity to naturally decrease down to 37% of the present value (exponential decay). Cumulated quantity of current (integral, given in Ampère.hour) since the beginning of SOLEIL. Mean value of the gas pressure in the vacuum chambers where the electrons are circulating. Variations (standard deviation and peak) of the position of the beam with respect to the theoretical axis of the storage ring, in the horizontal (H) and vertical (V) planes. These values (in micrometers) are good indicators of the stability of the beam. Product of the the size by the divergence of the electron beam. The horizontal emittance is given in nm.rad (10-9 m.rad) and the verical one, ~100 times smaller, is given in pm.rad (10-12 m.rad). These values are representative of the beam horizontal and vertical sizes respectively. Wavenumber related to the focalisation settings in the horizontal and vertical planes.